← – Are cars the key challenge? 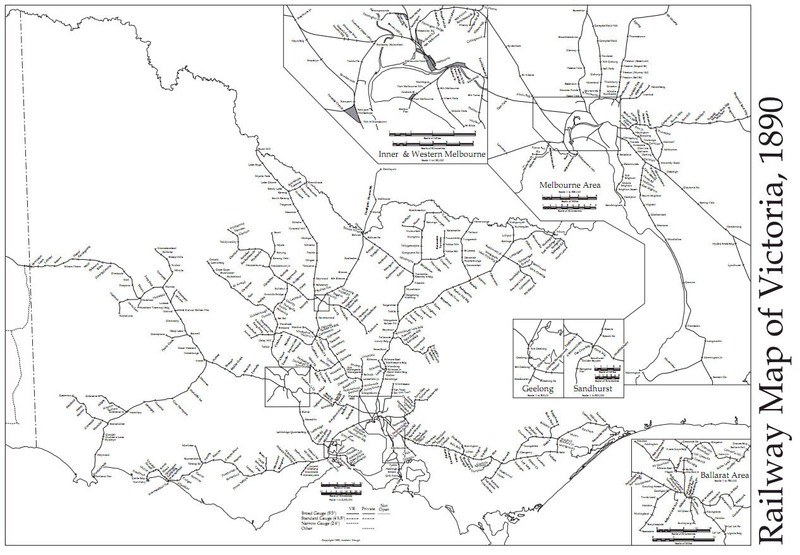 Fourth, many Melbourne train lines also extended beyond the metropolitan boundary to country areas and interstate. They did double duty, carrying not only suburban commuters but also country freight and passengers. As this was an era when a much higher proportion of the nation’s population lived in the country, it would have made the case for building new lines right into the heart of Melbourne considerably stronger. Of course, country trains didn’t have to compete against trucks or planes, either. Fifth, there was much less urban development to negotiate back then compared to what would be involved in replicating the network today. Any new rail line within the built-up area would, like the Eastern Suburbs rail line that opened in Sydney in 1979, necessarily involve extensive tunnelling, ‘cut and cover’, or elevated rail lines e.g. see the proposals for Rowville and Doncaster. Sixth, construction and operating costs were lower. Less was spent on protecting the environment and on the occupational health and safety of workers. Engineering standards were less demanding and financial and corporate regulation was a lot less onerous. Most firms didn’t pay superannuation and sick leave provisions were parsimonious by today’s standards. Passengers also had lower expectations of comfort and safety. There’s an argument they were also more disciplined and compliant, enabling costs to be saved on factors like dwell times and platform sizes. So it’s not surprising that it is much harder to build and operate rail lines today. Technology and capital were deployed to offset rising labour costs but the rate of productivity gain doesn’t seem to be fast enough, at least in recent decades, to keep up with the overall rate of increase in costs. I expect there must be some positives on the other side of the ledger — such as more flexible working hours and opportunities for automation — that favour the provision of rail today relative to 100 or more years ago. Most of those positives however seem to be on the operating side rather than the construction side. Some of them also favour other public transport modes like buses. None of this leads inevitably to the conclusion that we should give up building new rail lines. But it should caution us about extrapolating too readily from the conditions of the past to today’s circumstances. Roads provide an instructive example – despite immense public support, even urban and interstate freeway networks are modest when compared to the hundreds (and in the country thousands) of kilometres of rail line that were laid down before the Great Depression. Perhap we have just forgotten how to build rail. The south morang extension is way over priced. Also, look at the costs for NBN rollout of fibre to the home. An aside: The South Morang extension of the Epping line was taken as evidence that the former government inflated cost estimates, but now the Transport Minister is saying that the Regional Rail Link was under-costed by up to $700 million. Wonder if we’ll see any savings from South Morang? I think the question is “do we need to build more rail lines”? I think the answer might be NO. I’d rather see a focus on unblocking existing infrastructure to run trains more frequently in the off-peak like signaling, stabling, track amplification and maintainence where required and so forth. People are confusing infrastructure with services. Having lots of rail lines everywhere does not necessarily guarantee high frequency service. In fact it might split the frequency on the branches, cause extra conflicts and make the network more complicated to operate leading to “low frequency everywhere” and a very large and expensive asset to maintain when compared to the load it is carrying. Melbourne has 200+ train stations, why not extend their reach by using frequent buses? Alan, on point two. Melbourne lines stopped being profitable much earlier on – pre 1880s, although the trams kept being profitable while they remained cable-cars. After the 1880s the government stepped in, and via the combination of rampant corruption and misplaced optimism in the largest real estate bubble in Australian history built 90% of the existing network – most of it completely wasted expenditure that crippled the finances of the state government for decades afterwards. Realistically, the railway history of Melbourne is a case study on how not to plan and build a network – some bits of it are only just being properly used in the past two decades, and the legacy infrastructure is a huge burden on the current system. Russ, when you say profitable, are you including capital costs? Do you have happen to have info on when the railways operating costs started to consistently exceed operating revenue? Alan, I’ll get back to you with specifics and references. Books are at home. But in broad terms, railways were reasonable propositions to build because the capital costs were met from sub-dividing adjacent properties. The operating revenue almost never met operating costs however, and except for the Melbourne and Hobson’s Bay lines, every private railway seems to have been broke within a few years. Yes, only the first few lines were private, and hoped to be profitable, but never paid very well. From the beginning only the state government could afford to build long country lines, starting with bendigo in the 1860s. All the private suburban lines were taken over by the Victorian railways by 1865, by which time their value to economic development was seen as huge – and not just from subdivisions – they were indeed the freeways of the 19th century. As to more or not – I dont see why a few extensions to the existing system should be too difficult. In terms of my second point in the post, the question then would be: would a new rail line take more from the budget to build and operate today than it did in the late 19th century? Rohan, there’s an interesting angle to the point you make – are rail lines seen to deliver the same level of short-term economic benefits today as they used to? I think the answer to that is no, and that’s another reason why they’re harder to build. These days rail is mostly marketed in terms of its environmental benefits. The average loss in operating the railways throughtout the 1890s was 1000 pounds a day. By the run of the century, a total deficiency of 9 million pounds had been reached. The interest in this figure, and on the capital costs, crippled Victorian budgets for decades. During he 1950s, the interest payments alone on the Victorian railways were costing up to 4 million pounds a year. By 1955 many of the lines built seventy years before were literally falling to pieces. In the ten year period 1955-64 there were 558 derailments on Victorian lines, and the number was increasing each year. The State Public Accounts Committee reported in 1964 that nearly 70 per cent of Victoria’s rails, and 35 per cent of its rolling stock were more than 50 years old. The trams were owned by a trust comprising the local councils, and leased (for free) by the tramway company from their inception to 1916 (when the lease expired). See Mind the Curve by Keating for their history. As far as I can tell, they covered their costs (interest on capital loans and operating) until that date and the decision made to electrify the lines under the MMTB. In terms of the relative subsidies per passenger, the relative costs of the tram and train probably still hold today.